Can't get enough of all things Korean? 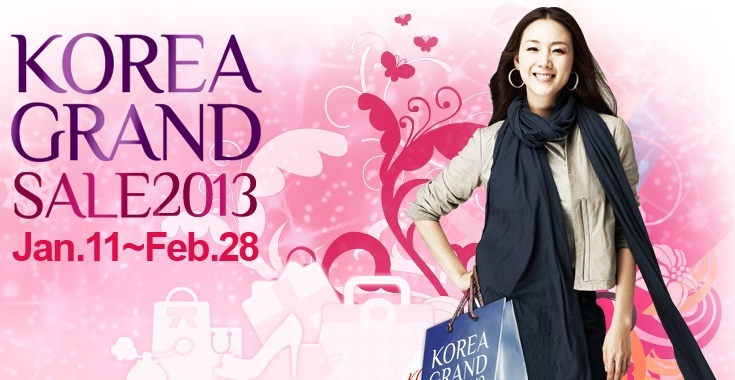 Get your fix with the KOREA GRAND SALE 2013, which will run from 11 January to 28 February 2013, at major shopping areas around the Seoul metropolitan area, Gangwon-do and Jeju-do. 24,000 stores in 20 different fields will be offering international visitors huge discounts, freebies and special offers on shopping, lodging, food beverages, art performances and more. An opening ceremony will be followed by various events, including a K-Pop concert, themed weeks of each participating vendor, and other interactive programs, to encourage visitor participation and elevate the festive atmosphere. Also during the festival, foreigners will be able to utilize different shuttle buses ensuring convenient transportation. A nationwide circle line shuttle bus for foreigners only, K-Shuttle, is already in operation. These will circle major tourist attractions from Seoul, Gangbuk and Gangnam. 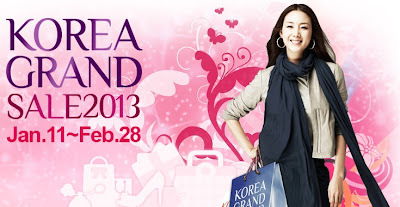 Tourists can download discount coupons from the Korea Grand Sale website and present them at stores. Coupons can be used in online, mobile and paper mode. Expect to see the shuttle bus schedules and coupons up on the website from January 2013 onwards. Article brought to you by the Korean Tourism Organization.